Egypt's Tourism and Antiquities Police (TAP) on Tuesday reclaimed 10 artefacts stolen during the January 2011 uprising, according to Antiquities Minister Mohamed Ibrahim. A police agent posing as an antiquities trader met the alleged thieves and offered to buy the stolen artefacts, said Ibrahim. The head of the smuggling gang agreed to meet the agent in the Al-Nozha area of the east Cairo district of Heliopolis. When the transaction was completed and the agent had secured the artefacts, a TAP team broke in and made the arrests. Ahmed Sharaf, head of the ministry's museum department, told Ahram Online that the objects are all in poor condition and will be restored. 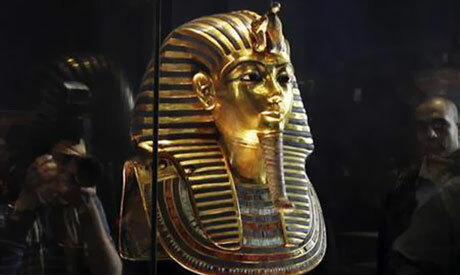 The 10 artefacts, stolen from the Egyptian Museum on 28 January along with 44 other pieces, include of a wooden statue of King Tutankhamun covered with gold sheets and a collection of bronze, wooden and gilded ushabti figurines of his great-grandparents Youya and Thuya. A bronze statuette of an Apis bull is also among the recovered objects. Ibrahim told Ahram Online that most of the objects stolen from the Egyptian Museum during the 2011 revolution have been recovered, with 44 out of 54 stolen artefacts returned. The objects will be restored and then placed in a special exhibition in the museum for a temporary period until they are returned to their original locations, said Ibrahim.